Shrubs are the oldest thing to be new again. 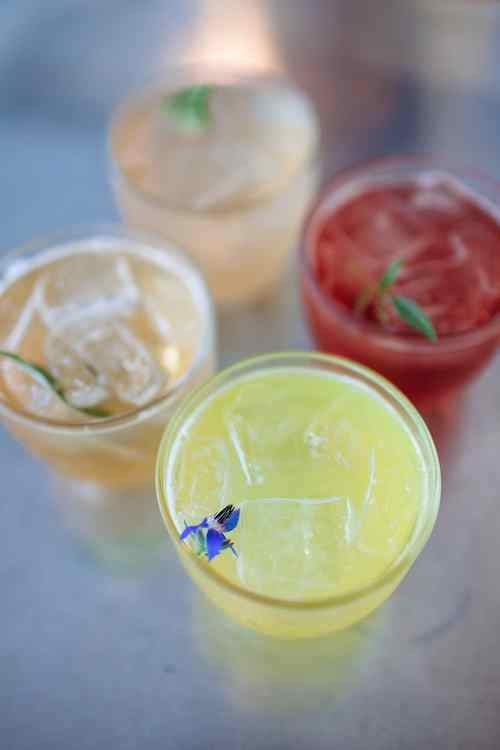 Somewhere between cordials, aperitifs, lemonade, and kombucha is a cool, tart drink that’s equally trendy and quaint. It’s also got a homely name: The shrub. Novelty-hungry foodies can brush up on its history with a raft of new shrub cookbooks, four having been released last year and one on the horizon for this spring. At least one company, INNA Jam, has the shrub as its business backbone. The list-happy website Buzzfeed has repeatedly advised its readers to get in on the shrubby action, while Pinterest has a rabid following of “this-you-must-drink” boards solely devoted to this sharp little beverage. Brush aside the topicality, though, and there are centuries of tradition. Shrubs encapsulate the kind of values with which many of us yearn to reconnect: Seasonality, preservation, and thrift. Their purity of flavors, kissed with the brightness of vinegar, tie together old and new. Modern shrubs may or may not have a teensy smidge of alcohol—and, as you’ll find, they may not even have fruit—but they all have fermentation and sugar in common. Shrubs go way, way back. The drink’s unusual name is thought to be derived from the Arabic word sharab (“to drink”) and Middle Eastern chilled fruit drinks known as sharbat (the origin of the term “sherbet”). Early versions of shrubs in England got their kick from citrus and had generous quantities of sugar and alcohol as preservatives. Why are people rediscovering shrubs now? The drink slakes our increasing thirst not just for something different and flavorful, but for something meaningful and mindful. “It’s about working with what’s given to you and capturing the little bits of every season,” Helquist says. Beyond its food service and retail, SHED is also gloriously curated space for shared learning, making it an ideal spot for shrubs to bloom—they play a starring role not simply as a beverage, but as an opportunity to reassess the meaning of abundance and locality. People who glean bring fruit by, and that influences what winds up at the fermentation bar. The drink becomes a collaboration between nature, SHED, and its customers. Helquist says that she gets a chance to let her background as a pastry chef shine with the shrubs, where she can play matching different flavors together. In early January, for example, she offered a shrub of quince with vanilla and Champagne vinegar. “People are itching for Meyer lemon now, too,” she says. Not all of the shrubs at SHED are born of fruit. Helquist has also served carrot and tomato shrubs as well as rhubarb. (Rhubarb and quince are unique among shrub fodder because they work best when they’re cooked.) Among the more challenging fruits to get shrubbin’ are persimmons and figs, and Helquist is hoping to soon conquer medlars, a knobby, apple-like fruit that looks somewhat like a rose hip on steroids. She mixes the fruit and sugar, allowing it to ferment for a week and release “a dense, cordial-like syrup.” Then Helquist adds her vinegar of choice to stop the fermentation. The mixture can then be frozen or canned for a sunny taste of peaches in February or a dose of apple in March. What’s more, the drink has been seized upon by the new crop of mixologists as a lovely base for cocktails. SHED is also riding that wave, introducing a new slate of beverages called “Shims,” because, like the carpenter’s tool, they tend to level things out. But instead of taking the wobble of out a table, Shims take the wobble out of a bad mood or a rotten day. The idea of drinking vinegar at lunch or even the cocktail hour may seem unusual at first, but consider: Most vinegars are made from fruit to begin with, and its role in the drink is to both extend its keeping qualities and to stimulate the palate. 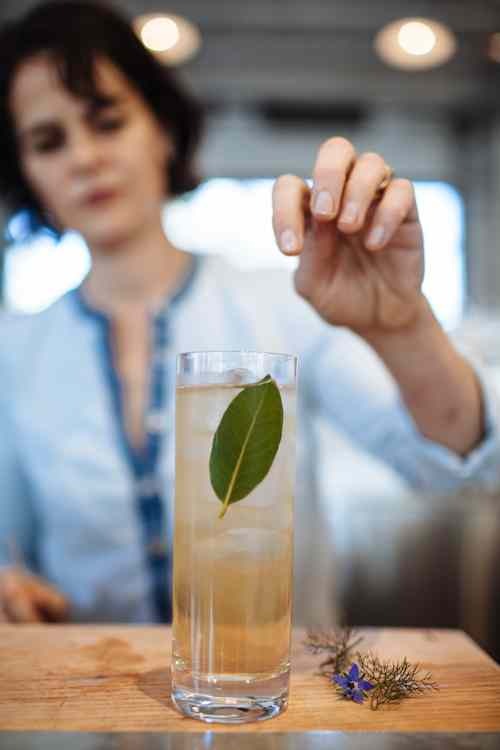 Helquist uses an arsenal of different vinegars in her shrubs, pairing them strategically with whatever fruits she’s got going. Some of the vinegars she recommends include sherry, apple cider, red and white wine, rice wine, and Champagne. “I steer away from balsamic,” she says, as it’s too assertive for the lightness of many shrubs. That a funny-sounding drink can foster community and curiosity is the wonder of shrubs. They’re really a gateway to something bigger, a rare reconciliation between the reality of our current methods of acquiring and enjoying sustenance, and the murky, idealized ones we strive toward hopefully every day. That’s a sweet and tart pleasure, indeed.